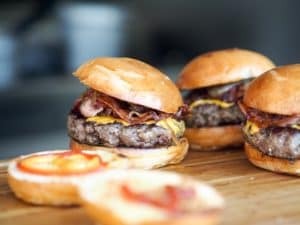 Whether you’re grabbing a quick bite between errands or quelling the hunger pangs that come with a late night out, fast food always seems to hit the spot. However, that doesn’t mean you have to go to same old restaurants. While no one’s doubting the delicious qualities of Taco Bell, McDonald’s or Wendy’s, Indianapolis has plenty of local fast food institutions. Not only will you get tastier and better food, but you support a local business at the same time. The next time you’re in the mood, head to some of these places in Indy. More than just burgers and fries, Mug-n-Bun is an Indianapolis institution. Serving up fine foods for over 50 years, this drive-in and diner is widely regarded as the best place for early morning hankerings and semi-late night eats. Grab a monstrous Super Burger, hand-dipped onion rings with secret “coney sauce,” and a refreshing milkshake or homemade root beer. When you add it all up, it’s still cheaper than most other restaurants and always leaves you wanting more. If you’re looking for a heavyweight burger that packs a wallop, head over to Punch Burger. With grilled cheese, nine specialty burgers, and loads of beers on tap, it’s the perfect one-two punch you’ve been craving. The Aloha burger whisks you off to the coasts of Hawaii with generous helpings of ham, grilled pineapple, teriyaki sauce, and swiss cheese piled high on one of their signature burgers. If you start to feel an ocean breeze in your hair, chances are you should pass on that extra beer. Similar to Mug-n-Bun, Edward’s drive-in offers 1950s diner food favorites, complete with carhop service. However, this diner hangs its hat on tenderloins rather than traditional burgers or cheeseburgers. Each handmade pork tenderloin bursts with flavor, and even “Man v. Food” host Adam Richmond gives his seal of approval. If you have the opportunity, look for pictures of their 150-pound tenderloin, which Edward’s made as part of the Indy 500 celebration. If you’re searching for delicious fast food, you might not even have to hop in the car. The Indianapolis Food Truck Alliance is a group of food truck owners that serve up some of the finest eats ranging from pretzels to subs to fusion food. All you have to do is head over to their website to find where the food truck is, walk up, order, and enjoy your experience. Mixing strange interior decor with some of the best burgers, poutine, and drinks you’ve ever tasted, 317 Burger is in a class all its own. On the weekends, it’s open until 11 p.m., giving you ample time to satisfy your hunger before a night on the town. When you arrive, grab a pint and sit at either the bar or a table. From there, peruse the menu, which features 14 signature burgers, wraps, wings, salads, quesadillas, and more. Fast food equals good food. It’s as simple as that. Although you might feel your arteries panicking and your heart murmuring, it’s worth it to experience culinary delights that only Indianapolis can offer.